On Episode 42 of the @dynocrossroads pod, @pahowdy and @jakeandersonff discuss the recent twitter dynasty rookie mock draft where we took Dane Brugler’s latest 7 round NFL mock draft and made our rookie selections based on those landing spots. On Episode 38 of the @dynocrossroads, @pahowdy and @jakeandersonff discuss the NFL Combine and how it influences our process. On Episode 37 of the @dynocrossroads, @pahowdy and @JakeAndersonFF break down this years rookie QB class from a film and analytical perspective. On Episode 36 of the @dynocrossroads, @pahowdy and @jakeandersonff discuss four players from a film and analytical perspective. On Episdoe 34 of the @dynocrossraods, @pahowdy and special guest @tacitassasin13 from the Dynasty Dummies break down Ohio State, WR, Parris Campbell and Malone University, WR, Ashton Dulin from a film and analytical perspective. 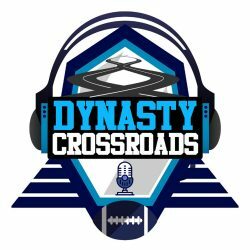 On Episode 33 of the @dynocrossroads, (@pahowdy) and (@jakeandersonff) discuss seven prospects from a film and analytical perspective. David Montgomery, Rodney Anderson, Darrell Henderson, AJ Brown, Kelvin Harmon, TJ Hockenson and Noah Fant.